Sarah Ho, Park Scholarships senior assistant director, was selected to receive the 2018 Award for Excellence for the NC State University Chancellor’s Unit. 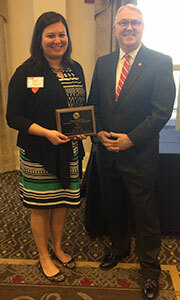 She was selected from a field of outstanding employees who contribute greatly to the university. In the Park Scholarships office, Ho leads the execution of most of the Park Scholars’ developmental experiences, including two Learning Labs, two retreats, a year-long Freshman Seminar, Service Raleigh, and the Park Enrichment Grants. She also plays key roles in the selection process and in advising students. Ho’s commitment to making the university and surrounding community a better place can be evidenced through other tremendous endeavors. She currently works as the chapter advisor for a Greek organization at NC State and as a Big Sister to an at-risk child in Raleigh.